After devoting a number of resources toward developing VR content to modernize the delivery of its news content in recent years, The New York Times is expanding its capabilities to include augmented reality as well, a mission outlined in a manifesto published on Thursday. 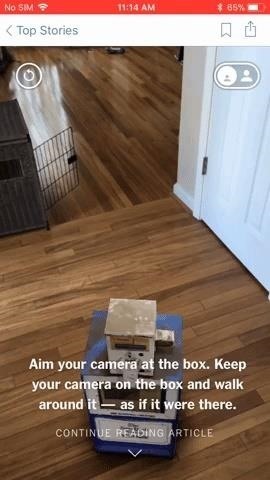 Through an ARKit update to its iOS app, the publication will begin splicing AR content into its news stories. The publication promises that Android support is "coming soon." 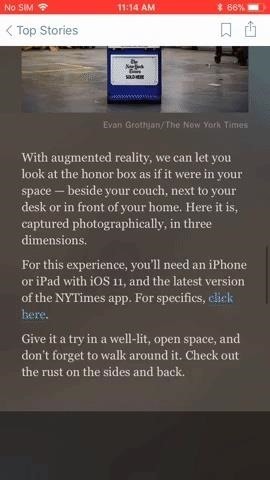 As a sample, the aforementioned manifesto, as displayed in the mobile app, now features a hologram of an honor box that readers can view through their iPhones and iPads. 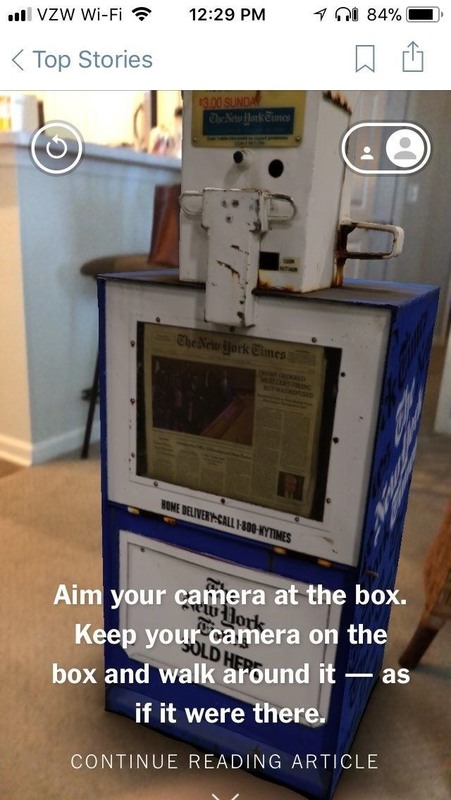 The AR content is embedded in the story, and readers are instructed to enable camera access and aim their device when they scroll to the bottom of the page. Once played in physical space, the AR model can be scaled from life-sized to tabletop size. The newspaper's coverage of the Winter Olympics next week will serve as its first real showcase of AR experiences in news content. The New York Times Company has previously explored using AR in journalism with its iOS app promoting the movie Hidden Figures. However, the fine print for that app notes that the New York Times news and editorial staff were not involved in the creation of the app's AR content. In recent months, news organizations have begun to show their favor for AR over VR. Time Inc. publications and The Washington Post have already shown the industry how AR can help enhance content and make news coverage more interactive. "Something profound has happened to your camera. Its very purpose—capturing images—has expanded to include a new role: creating a bridge between our physical and digital worlds," wrote Graham Roberts, director of immersive platforms and co-director of the virtual reality program for NYTVR, in the AR feature's introductory piece. "The camera can become a window into a world enhanced with digital information—adding a piece of sculpture to your bedroom or a car to your driveway. Neither actually there, but appearing to be and believably so."